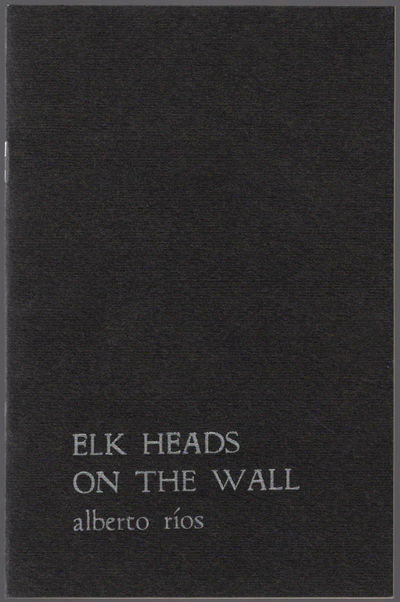 Elk heads on the wall. San Jose/Berkeley: Mango Press/Chicano Studies Program, UC-Berkeley, 1979. 16mo (16.5 cm, 6.5"). 21,  pp. First edition. One of 350 copies. #4 in the Chicano Chapbook Series published by the Mango Press. Printed in Mexico: "en los talleres de Imprenta Zavala, San Idelfonso y Carmen, Me?xico 1, D.F." Inscribed copy: For John [Randall] — My best to you and the work you've done. Alberto, October 16, 1998 Santa Fe" (on the title-page).